Feeling overwhelmed? This easy-to-follow guide to stress management is the perfect solution for teens in desperate need of downtime. With schedules packed full of obligations ranging from academic to athletic to social, today’s teens know all too well the heavy toll that stress can take. And with the ever-present pull of technology, the idea of unplugging feels practically impossible. 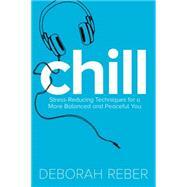 But there’s a way to relax without sacrificing productivity, and Chill will show you how. Explore a variety of techniques—including time management, visualization, exercise, and other creative outlets—that can take away tension and help organize your life. From de-cluttering your desktop to declining unimportant invites, the info, insight, and tools offered in Chill will leave you with less stress, more happiness, and a blissfully balanced life. So take a deep breath, get ready to feel better, and Chill.